In the 1888 book “Cincinnati in Wort und Bild” by Max Burgheim, there is mention of the Musik-Verein Halle. 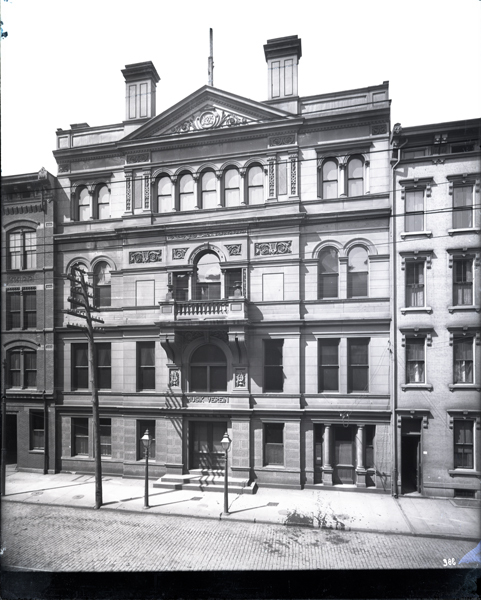 The Cincinnati Musik-Verein was formed in 1883 by the consolidation of the Maennerchor and the Germania. It is interesting to note that Mr. Burgheim’s book is in German and was printed at the M. & R. Burgheim Verlag at 484 Vine Strasse. Verlag means publishing house. Search the Cincinnati Historical Society Library online here. how completely sad…..I used to live two doors away from this spot, and always wondered what used to be there… Between that building, and the Germania building of 13th, and Walnut, this must have been one of the most beautiful blocks in OTR…..
Ellen, do you know when it came down? When was this torn down? I’m not sure but it was down by 1936 when its neighbor, the American Building, was built. I’m not sure if it was down in 1936, actually. ps…you can still see the white tile walls, on the left of the building still standing, where there must have been the first floor restrooms of the Musik-Verein Halle……so this was a Music hall of some kind…does anyone know what Verein means? I meant to say this in the post, but “Verein” means “association”. The more athletic Turnerverein hall still stood a block or so north of this on Walnut, but was torn down in the 70s, again for parking. 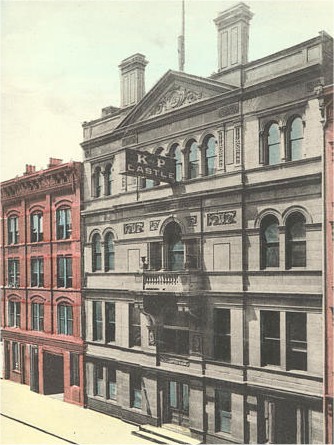 The Miami Purchase Association, forerunner of Cincinnati Preservation Association had no interest whatsoever in OTR. It was baffling. Nemo is right. The Turnerverein was around in the 70s and its demolition is one of the most tragic as it was an integral part of German OTR. The Miami Purchase Association merits some investigation as its efforts focused less on OTR in favor of other neighborhoods. These were conscious decisions that should be better understood by today’s preservationists. Buddy Gray and the fight against OTR being listed on the National Register of Historic Places is also worthy of our attention. Seth & Nemo–OTR NR nomination was prepared by MPA. Ever hear of their Amazing Race project? Or their Preservation Fund’s collaboration with Heritage Development Corp to save buildings on Race St? Or their attempt to have OTR designated a National Historic Landmark? Also, did you hear of MPA’s successful fund drive to restore Memorial Hall? They also moved their offices into the Hall for several years. Margo, you’re right. My point was that MPA which became the CPA in 1992 always had a larger focus and has never been able to get a strong foothold in OTR. The OTR NR nomination process is a great example of MPA’s efforts being stymied by the street-fighter tactics of Buddy Gray. MPA did great work and continues to do so as CPA. I sincerely hope they can help showcase OTR on a national stage as its redevelopment flourishes. Reading into the history I’m absolutely appalled at the amount of damage Buddy caused to the neighborhood all the in the name of a “good cause”. There are few people who give me as much vitrol as he does.